Handmade Christmas decorations offer a sense of nostalgia. As the decorations roll out every year, there's always that one handmade decoration or ornament that brings a smile to the face. To keep tradition alive and to treasure a keepsake for years to come, encourage a child to make a Christmas craft. Consider making a simple holiday decoration, such as a Christmas tree made out of Styrofoam cups. Many of the supplies needed to make the tree can probably be found in the home. Supervise younger children with scissors and hot glue. Enjoy showing off the final product for years to come. 1. Make a vertical 1-inch cut through the rim of a Styrofoam cup. 2. Cut the rim off the top of the cup. Discard the rim. 3. Place scissors back into the start of the cut made in step 1, then continue to cut the cup until reaching the bottom. 4. Cut the circular bottom out of the cup. 5. 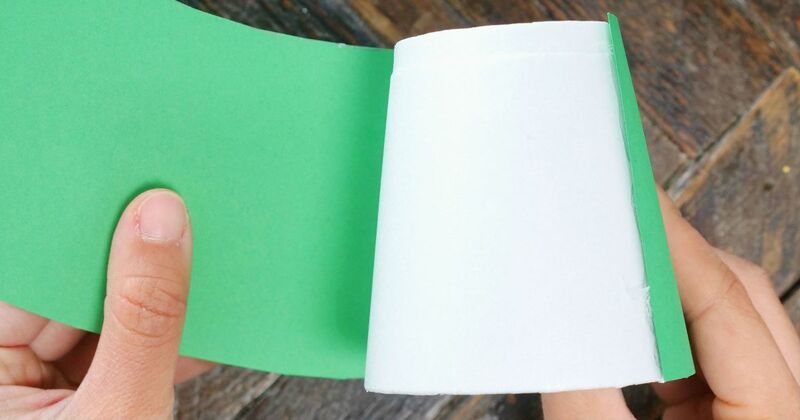 Place a green piece of construction paper on a flat surface. 6. Spread open the Styrofoam cup flat on the green paper. 7. Trace the shape of the cup onto the paper with a pencil. 8. Cut the shape out of the green paper. 9. Use hot glue to secure the paper from the previous step to the cup. 10. Cut 1-inch deep fringes all the way around the rim of the cup. 11. Repeat tep 1 on five additional Styrofoam cups. 12. Repeat tep 2 on five cups from previous tep; however, make each cup a little shorter than the previous one. Remove the rim plus a little extra Styrofoam on each cup. 13. Repeat steps 3 to 10 on all 5 cups. 14. 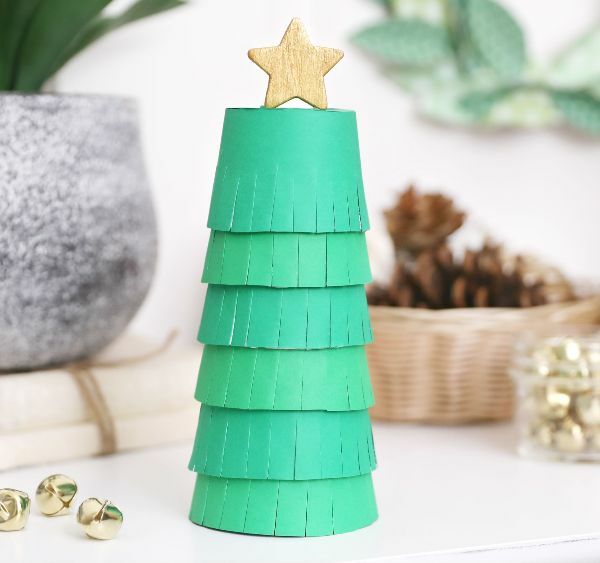 Place a green piece of construction paper on a flat surface. 15. Trace the bottom of a cup on the paper. 16. Glue the paper to the bottom of the shortest cup. 17. Stack the cups upside down, with the tallest cup on the bottom. The shortest cup should serve as the top of the tree. 18. Glue a wood star to the top of the tree with hot glue.